Just a few hundred meters from the route of the future westpark Tollway is Parkside, Houston's first community designed with New Urbanism features. For those not familiar, New Urbanism is a strong nationwide movement that seeks to build more compact neighborhoods, more like what existed before automobiles or what you find today in Europe. Seaside, Florida, is a well-publicized community that was featured in the film The Truman Show with Jim Carrey. I consider New Urbanism to be associated with anti-freeway forces, so I'm covering it in texasfreeway.com. For more information on New Urbanism, see http://www.newurbanism.org/. New Urbanism has not been well accepted in Texas, not even here in Austin. And the few communities that I have seen are far from the ideal standard of New Urbanism. I visited a new community north of Austin in Georgetown, and discovered that it really only incorporated a few elements of New Urbanism and still adhered to traditional Texas values of low density and car accommodation. There are (almost) no bricks to be found in any of the home, even though nearly all new housing in Houston is at least 50% brick. However, the exterior of the homes is comprised up Hardi-plank, a concrete-based composite material that carries a 50 year warranty. The houses are very simple in design. Cheap, cheap, cheap. So if you make everything as small and cheap as possible, what do you get? Low cost/affordable housing. Of course, there's nothing wrong with that, since that market segment needs to be served. However, I cringe every time I see (what appears to be) low-quality structures being built in new real estate developments, contributing to new sprawl. My first impulse to think "instant slum". New Urbanism neighborhoods are intended to promote a greater sense of community, which should help stave off neighborhood decay. Only time will tell how well Houston's flavor of New Urbanism will hold up. 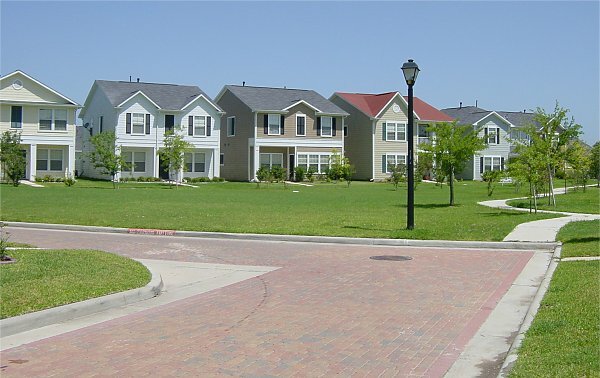 And to be fair, conventional neighborhoods all around Houston have decayed into suburban slums, so it cannot be said that conventional-style neighborhoods in Houston are decay-resistant. And it should be pointed out that Houston-style New Urbanism is far from the ideal standard of New Urbanism. New Urbanism purists may not even want to be associated with Parkside. 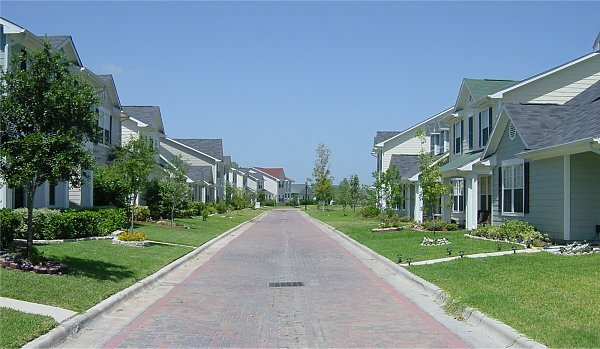 Parkside is designed to be an auto-dependent community. I don't think there is any transit serving this area. If there is, it's not anything that's practical to use as primary transportation. The development itself includes no mixed use activities such as shops and offices. There is a convenience store just outside the community within walking distance, however. Soon, however, Parkside residents will have something that few New Urban residents have: a brand-new tollway that will zip them into town! 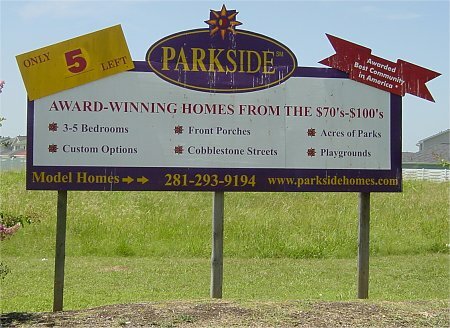 Parkside received the 1999 award for Best Single-family Community in America from the National Association of Homebuilders, National Sales and Marketing Council, for entry-level housing. Photo taken 21-July-2001. 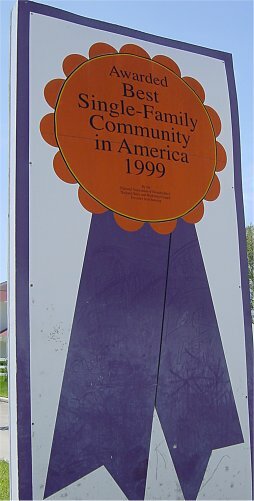 Main sign at neighorhood entrance. Photo taken 21-July-2001. The entrance to the community has an access gate. I was able to follow someone in. Photo taken 21-July-2001. Typical houses in Parkside. Notice that the exterior material is all Hardi-plank concrete composite, which looks like wood. This is highly unusual for new housing in Houston, where new homes are usually 50-80% brick. Photo taken 21-July-2001. 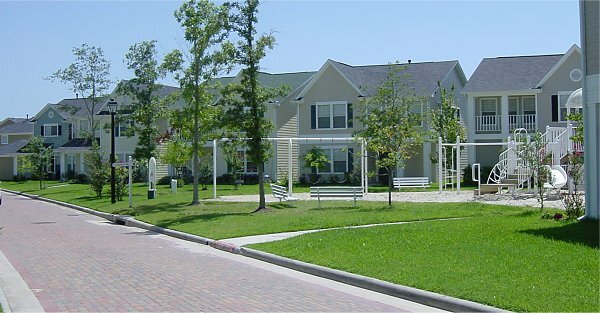 The community features small parks between the densely packed houses. Photo taken 21-July-2001. This park has playground equipment. Photo taken 21-July-2001. Another small park. Photo taken 21-July-2001. This is a typical street in Parkside. Notice that the street is very narrow, not really intended for cars. It is paved with bricks, a nice touch. There is no sidewalk, and the houses are about 10 feet away from the street. Photo taken 21-July-2001. OK, here's where traditional automobile values get their accommodation. The back alleys are very wide - wider than normal streets - and are designed to handle lots of cars. On my first visit to this neighborhood, this is where I found all the pedestrian action and human interaction. People working in their garages, kids riding their bikes and playing. On my second visit (when these photos were taken), it was 96 degrees so everyone was indoors. My understanding is that the human activity was intended to be on front side of the house. But realistically speaking, people do things out of their garages. Photo taken 21-July-2001. Another back alley. Photo taken 21-July-2001. A view of a row of houses from outside the neighborhood. Photo taken 21-July-2001. 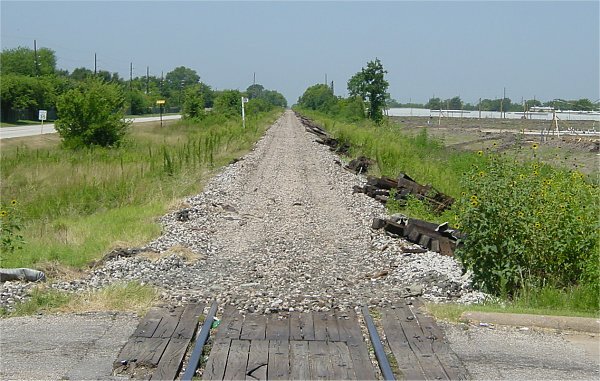 A few hundred meters to the south of Parkside, the railroad tracks are being removed from the Westpark corridor to make way for the Westpark Tollway. It is almost surely a coincidence that Parkside is located close to the future tollway. Photo taken 21-July-2001. 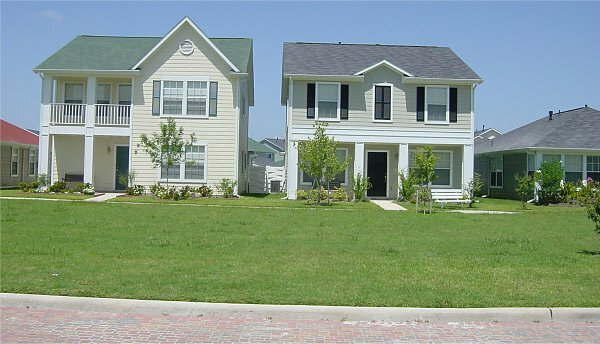 These are a typical new homes under construction in suburban Houston. Plenty of brick, attractive design, and built to last. This home is in Cinco Ranch, with the Grand Parkway embankment visible on the right side. Photo taken 21-July-2001.